The coast is now very clearer that Nigerians in Diaspora are earnestly yearning for His Excellency Atiku Abubakar’s presidency in the 2019 Nigeria General election. 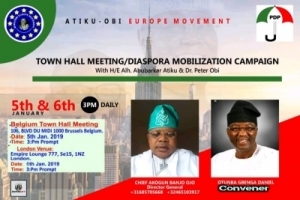 To this end Nigerians in Diaspora under the auspices of Atiku Obi Europe movement based in Belgium with branches across Europe had set aside two days, 5th and 6th of January 2019 for town hall meetings/mobilization campaign comprising larger societies of Nigerians across the globe. At a Press Conference addressed by the Director General of Atiku/Obi Europe movement, Akogun Banji Ojo in Brussels, Belgium early this morning which was made available to the Nigerian Press by the Nigeria Country Director, Deacon Joseph Lanre Anifowose, the two events scheduled for Brussels, Belgium and London in United Kingdom shall be attended by well known Nigerians across the globe. Meanwhile, the Presidential candidate of the People’s Democratic Party (PDP) in the 2019 general election, His Excellency Alhaji Atiku Abubakar, Dr. Peter Obi, Dr. Saraki, Otunba Gbenga Daniel, Hon. Secondus and other top leaders of PDP had confirmed their intention to attend the important gatherings. The epoch making events is aimed at having one-on-one interactive section with the Presidential candidates and other stakeholders of our great party on the manifestos of Alhaji Atiku Abubakar and his running mates for the Nigerian populace as well as Nigeria in Diaspora. You would record that Atiku/Obi Europe movement is a voluntary and self sponsored political affiliate that is born out of genuine desire by concerned Nigerians, home and in Diaspora to showcase the candidature of ALHAJI ATIKU ABUBAKAR AND MR PETER OBI to the World as a positive political development in Nigeria for 2019 Presidential Election because we believe that the opportunity to get a better tomorrow is here. 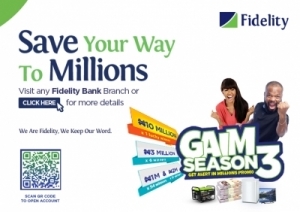 To Promote the Candidacy of His Excellency Alhaji. Atiku Abubakar and Mr. Peter Obi the People’s Democratic Party (PDP) Presidential Candidate for 2019 Election in Europe and the World at large. To Mobilize and ensures that Nigerians in Diaspora supports His Excellency, Alhaji Atiku Abubakar and Mr. Peter Obi for 2019 Nigerian Presidential Election. Mass Publicity and Promotion of the People’s Democratic Party (PDP) and its Presidential Candidate His Excellency Alhaji Atiku Abubakar/Peter Obi to boost his image among World leaders. To Broadcast to the World especially Nigerians both at home and in Diaspora on the MANIFESTOS and Cardinal programs of His Excellency Alhaji Atiku Abubakar. Be assured that the outcome and resolutions at the meeting shall be brought to public domain, the statement said.